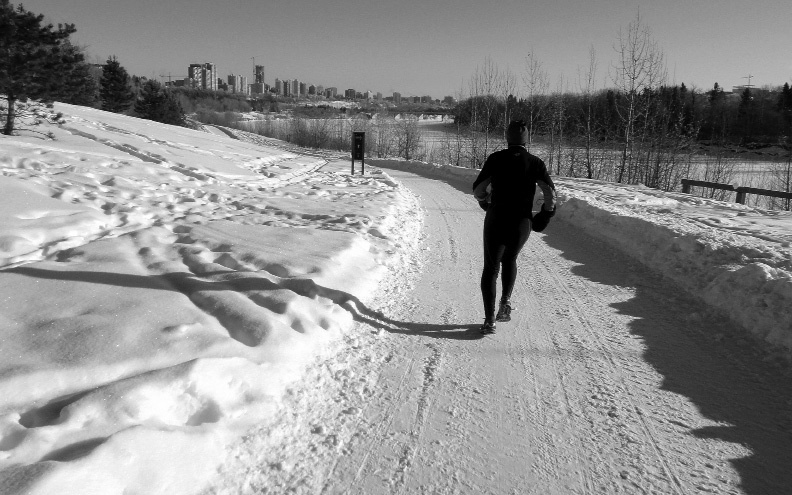 Calgarian runners won’t let a little frost or even a blizzard stop them from staying in shape and getting those extra few steps in. When you think about running in the winter, waking up early, putting all your gear on and facing the cold, does it put your mood on ice? Don’t be alarmed you are not alone. But if you are like many Calgarians who are passionate about running and aren’t afraid to brave our city’s frigid months, there are many products on the market that can kick your motivation into high gear. Elite running athlete and employee at Stride’s Running Gear Store in Calgary, Jenna Westaway, says the two brands that stick out in quality and comfort for winter running are Craft and Icebreaker. Craft is a company based out of Sweden that first started designing clothes for cross country skiing, but they were introduced into the running market for their warm, yet breathable, running tights and innovative vortex layer that stops wind and water from going into the clothing and hitting your skin. Icebreaker is another specialty brand that is made in New Zealand. They specialize in the use of merino wool that actually originated in New Zealand. They have special wool clothing that is “stink proof” and only works if you do not wear deodorant. Westaway says, “when you are choosing cold temperature running clothing it is better to go with wools, rather than synthetics and staying away from cottons.” Wool is far more breathable while other fabrics retain sweat, which in turn will make you feel colder. There is no doubt that in the winter it is a lot harder to go running than in the warmer months. There are constant obstacles that runners have to dodge: black ice, snow drifts and just trying to stay upright. Accomplished runner, Kenton Wilkinson, a long time marathon competitor and triathlete has experienced his fair share of unlikely weather conditions. The best way to dress for these conditions is not to over-layer. The more you layer the more you will sweat and as a result you will feel colder. One or two thermal layers and a wind suit to block the wind is ideal. Have you heard that running in cold weather freezes your lungs? Not true! Your body is an amazing machine and just because the temperature outside reads minus 40 Celsius, that does not mean that minus 40 Celsius is going in to your lungs. “At times during the race it did feel hard to breathe, the air was so cold and trying to see was obviously a nightmare, but you’re not really thinking about how much your legs hurt,” says Wilkinson. If you’re thinking about stepping up your running game and joining the rest of the outdoor enthusiasts throughout Calgary, the best option is to buy a good outdoor running shoe with lots of traction. Brooks and Innovate are good shoe brands to consider. Their outdoor running shoe has excellent tread, but the price is quite high. You’re looking at between $65-120 for a mid grade running shoe. “The price for outdoor running gear is pretty high because it is a specialty item. Companies use that to their advantage. If you’re going to buy it, you’re willing to pay the price,” says Westaway. If you are willing to brave the cold temperatures, the best way to finish your run is to “dress appropriately, including covering your mouth,” says track coach and life-long marathon runner Ron Balezantis. Balezantis competed in the Hypothermic Half Marathon where the temperature dropped below minus 40 Celsius, but he says he owes his success to being properly dressed. But for most runners, those temperatures are not even bearable to walk in. All runners are different in the temperature limit they say they won’t run in. If you are really struggling with getting motivated to endure the unforgiving temperatures, make sure you have a good group of people to go with. If you are a person who hates running, jumping on the treadmill won’t change your mind. People love being a part of nature and running is a great opportunity to explore that. If you have to run inside, do interval training and save your long runs for the beautiful outdoors. Many competitive runners suffer from Raynaud’s Syndrome, a condition where there is a pronounced lack of circulation to the hands and the feet. Limbs get quite cold very easily, making running outside unbearable. Make sure you do your warm up and stretches outside if you are planning on running outside, as well. This allows your body to acclimatize to the condition it will be working in for the next couple hours.